Easy to use - Kids love it! No muddy footprints in house! MonsterMulch or Chip at a depth of 5cm (2”) will give sufficient protection for a fall of up to 0.7 metres (2’3”) over concrete and 3.3 metres (10'10") over grass. For this you require 20kg per square metre. However we recommend that you use at least 10cm (4”) immediately around any play equipment to ensure sufficient depth is maintained in these busy areas. Does rubber chipping require a lot of maintenance? No, just rake over occasionally to ensure a tidy appearance and to maintain the correct depth. Dead leaves and other garden debris can be removed with a hand held blower without dislodging the chippings. 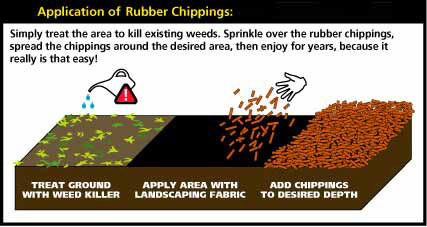 What is rubber chipping made of ? Recycled tyres with all traces of metal removed. 99.9% wire free and covered with a coloured polyeuthothane coat. Is it rubber chipping expensive? Initial costs are higher than with organic bark or wood chip,however as MonsterMulch does not rot or decompose it never needs to be replaced. Unlike bark and chippings which require regular topping up or replacement annually to retain their effectiveness as a safety surface. MonsterMulch rubber Chipping is made from recycled vulcanised tyres and will last for up to 50 years. The coating would depends upon heavy wear but should still be good for 10 years normal uses. Will Rubber Chippings stain my childrens clothing ? No, the colour coating does not wash off and unlike organic materials will not stain clothing. You may choose to hose it down when you recieve it to remove any factory dust. Will it be affected by mould or fungus growth? No, as it is an inert and hydrophobic material it will not sustain organic growth such as mould. No, MonsterMulch will not freeze and because it does not retain water at all the area remains useable in all but the most severe weather conditions. all over your garden by birds and other visitors on the look out for a meal ! To bond 100 Kilos of rubber mulch would require 20 kilos of resin.